Finally. Finished. I’ve been working on this so long. Since it didn’t require a pattern, it was my mindless knitting that I could do in the dark practically while we watch TV. But since we don’t watch a lot of TV, it took forever! 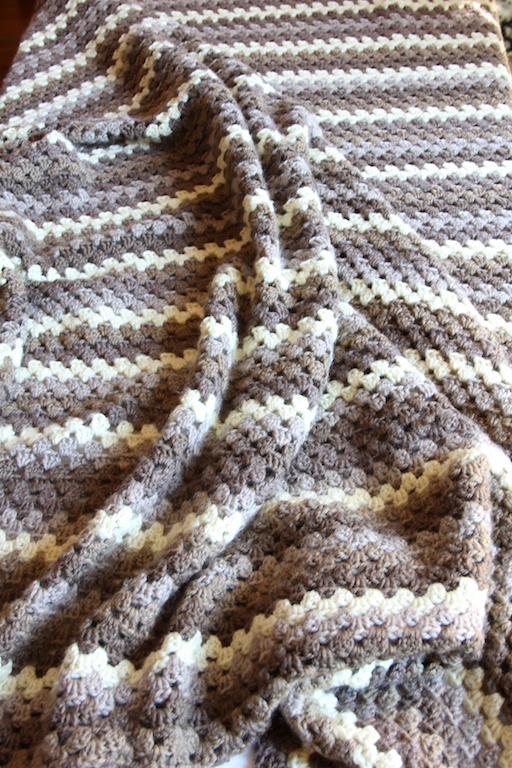 This blanket was inspired by granny stripe blankets I saw on Ravelry. The fun thing, too, about looking at all those blankets was all the different color combinations people used. 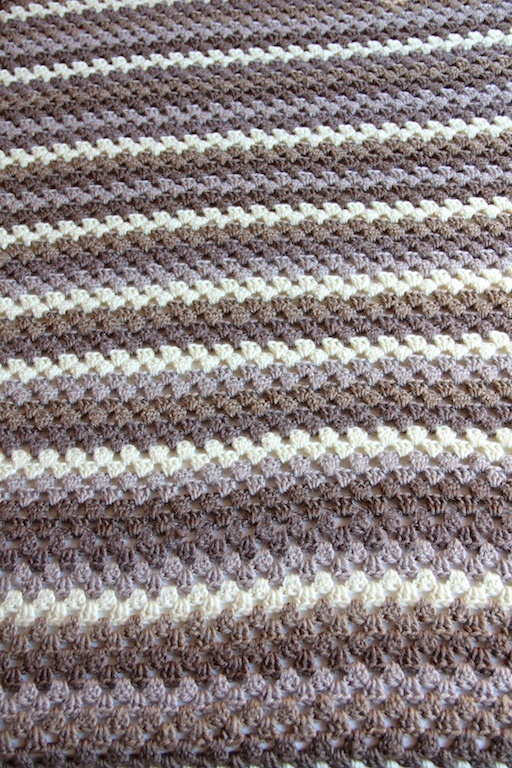 There are 2,286 Granny Stripes blankets on Ravelry. You could look at them forever. I love it! I chose colors that would go in our bedroom. We needed some kind of throw/blanket back there to use if someone wanted to take a nap. I decided to use Cascade 220 Superwash Wool so I could throw it in the washer. They also have a ton of colors in that line and I did not have a hard time selecting a few colors to perfectly match our bedspread. I used four shades of brown and a shade of pale yellow/cream. I decided to do a series of stripes by doing 2 stripes and then the cream, three stripes and then the cream, four stripes and then the cream, five stripes and then the cream and then reversing it. I don’t like weaving in all those ends, though! I crocheted until I felt the blanket was just big enough because I figure it would grow after I washed it and sure enough, it did. It really expanded, so I have a nice big throw now. The Cascade Superwash washes up really nicely. I threw it in the dryer on low and came out great. I’m glad to hear the Cascade 220 Superwash performs well. 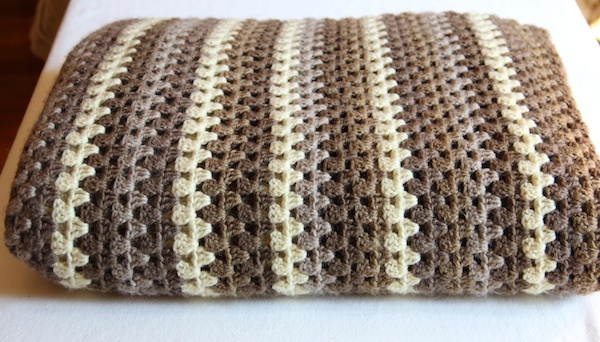 I just ordered some for a blanket I’m making, and it will be my first time using it. Your blanket is beautiful! 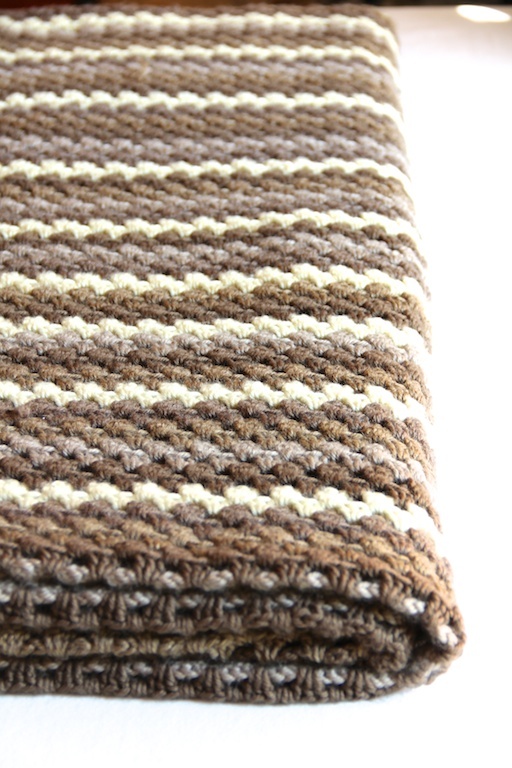 Nice colors and stripe pattern! Have you tried working the ends in as you go? Might be a little tricky but worth it if you can avoid doing it all at the end! I wish I knew how to work in ends in crochet as I go… I do that in my knitting all the time, but I’m having trouble in crochet. Need to google that, I guess! I love the colors! It has a cool ombre effect. Gorgeous! It looks so timeless in those cozy cappucino shades. It looks like the perfect blanket to snuggle under on a cold day! Your blanket is lovely! 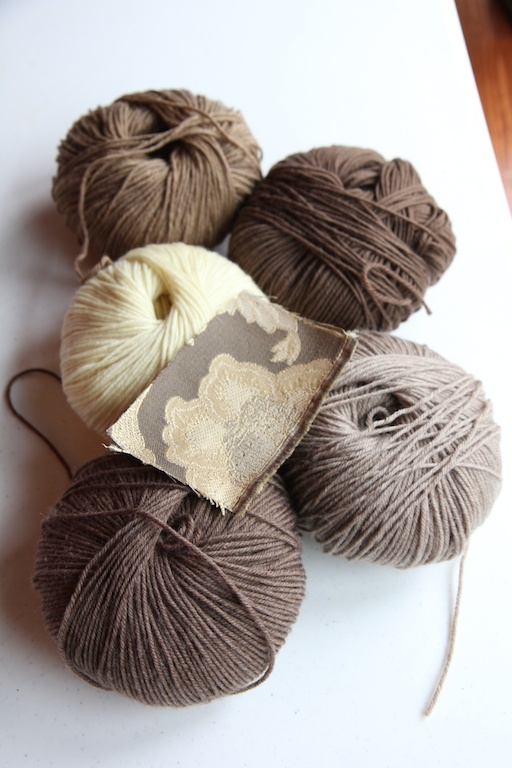 Any chance you can share exactly which colors you used (names or code #s) and how many skeins of each you used? 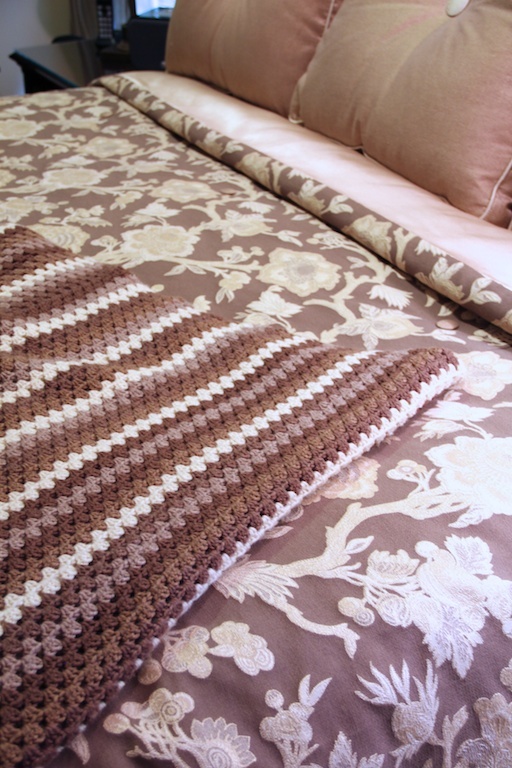 I would love to replicate this blanket and would so appreciate it. Thank you! Amy: Sure! At the bottom of the post is the link to my Ravelry page. That shows all the colors I used, although I never kept track of how many skeins I used. I know that I overbought and I have a lot of the Cascade 220 left. Hope this helps, though. Hi, I am going to be starting my first afghan. Yours is beautiful. I was wondering if you could give your thoughts on how to do the colors/stripes for mine. I’m using dark purple, white and black. I’m not sure what would look the best. Any thoughts would be appreciated!! Kelly: Because you are using just three colors, it won’t matter so much. 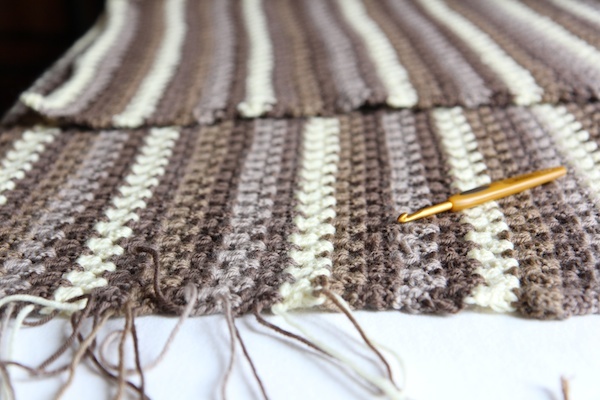 Unless you want to do one color twice in your repeat, just do the three colors in any order then repeat. If you want to repeat the white twice, then you could have a white stripe in between each stripe of purple and black. I personally would rather do just the three stripe repeat. Hope this helps. Thanks for your thoughts. I may add one more color, but I’ll go with your suggestion to just do the same stripe repeat. Thanks!